Compassion for Animals Drives Local SPCA at Adoptathon, LIVINGSTON, May 17, 2008 - Polk County SPCA held a pet adoptathon at Livingston Tractor supply Saturday from 9 am until 5 pm. The adoptathon was a success as animals were adopted and many people signed up to volunteer to help the SPCA. Volunteers are the strength of the SPCA which is in constant need of funding to care for animals correctly, many which have been dumped, discarded and would otherwise be homeless. 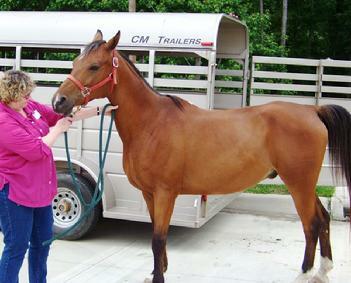 One of the SPCA's latest achievements is the nursing of a severely neglected horse. According to SPCA director Penny Glienke, the horse (named "Chester") was so starved that you could place your fist in between his rib cage and spinal cord and your fist would be flush on both sides. Now Chester looks like a horse you would see on a calendar. Chester is also up for adoption. 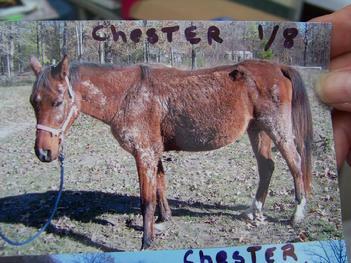 To adopt out Chester, the SPCA only asks for reimbursement on vet bills and the cost to feed him (comes to $300). The next Adoptathon is scheduled for Saturday, May 31st. In addition, the Polk County SPCA will be hosting a "Meet 'n Greet" with special guest Polk County Sheriff, Ken Hammack. The Meet 'n Greet will take place at Livingston Memorial Hospital Conference Room where the future of the Polk County Animal Shelter will be discussed. Refreshments will be served. Polk County SPCA's Website....and phone number is 967-CATS. Chester when the SPCA found him in January of this year. SPCA Director Mrs. Penny Glencky talks about adoptathon.